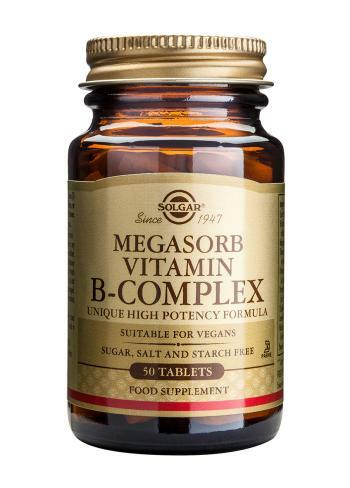 Solgar Vitamin B - The B Vitamins consist of a large number of substances that are involved in the metabolism of all living cells. Acting as co-enzymes, they work together with proteins in the various enzyme systems of our body. The functions of the B Vitamins are closely synergistic, and because of these inter-relationships, a deficient intake of one or more of them can cause deficiencies in the others by hampering their utilisation. B Vitamins are water soluble and are not stored in the body. They must be replaced daily, and any excess is excreted. Each tablet provides: Soya Lecithin (providing phosphatidylcholine)50mg, Pantothenic Acid (as d-Ca pantothenate, pantetheine) 50mg, Vitamin B6 (pyridoxine HCl, pyridoxal-5-phosphate)50mg, Thiamin (vitamin B1 as thiamin mononitrate, cocarboxylase) 50mg, Riboflavin (vitamin B2 as (riboflavin and riboflavin-5-phosphate) 50mg, Niacin (vitamin B3 as niacin, niacinamide)50mg, Inositol 50mg, Choline (bitartrate) 21mg, Magnesium (citrate) 20mg, Folacin (folic acid prep.) 400ug, Biotin (as prep.) 0.05mg, Vitamin B12 (cobalamin) 50ug.